It seems that everyone — regardless of level of success or actual rate of “productivity” — would like to be MORE PRODUCTIVE. I sure would. I have about 17 projects I would like to be working on apart from the endless should do’s (the dishes!) and hafta do’s (pay the rent! ), not to mention a full time job, a social life, and Netflix. There truly is not enough time to do everything, so I have experimented with various tools and productivity systems to help me prioritize and organize (though I make no claims to having an answer, some of my tools and tips are embedded below). In that process, I have come to question some widely-held productivity myths. MYTH 1: Productivity is not fun. Assess your goals. If your tasks do not truly support your personal goals, why are you doing them? We all have obligations to others/ employers, but if at least some of their goals don’t mesh with your own, there’s a disconnect somewhere. Delegate. Hire a cleaning service, get a virtual assistant, call in a favor, or simply assign the task to someone more suited to do it. Decide not to do it. Maybe it seemed like a good idea at the time, but it’s always an option to change your mind about applying to grad school or taking up Mixed Martial arts. Alternately, move it to your “maybe someday” list (those who follow GTD know what I’m talking about). Get it over with. I’m the queen of procrastinating phone calls, so if I want a quick productivity boost, I simply spend 15 minutes making appointments. If it’s something that takes less than 5 minutes, just do it and get it off your list. Add tasks that make you happy AND support your goals. Family outings, articles to read, writing blog posts, meeting up with old friends, or having a spa day are all productive things that might also be fun things to do. MYTH 2: Busy people are productive. Protect your boundaries and say no to things that keep you busy but unproductive. Decline meetings that are not useful to you. Limit activities that require a lot of commuting to and fro. Pick three most important tasks and finish them (finish them!) as early in the day as possible, before the inevitable new fires start popping up. Schedule down time. Taking a break to read, nap, or stare at the ceiling will actually improve your focus and overall productivity. MYTH 3: Multitasking is a thing. And you should be good at it. Multitasking is not even possible. I hear you thinking, “but I multitask constantly!” Yes, you think you do, because you are bouncing from task to task without finishing any of them. Our brains are very good at leapfrogging from thought to thought, which is not necessarily helpful all the time. But the fact is, your brain can only be doing one thing at any given moment. Staying focused on a single task is far more efficient than switching gears constantly, so you are better off mastering the art of uni-tasking. Use the Pomodoro technique and focus on a single task for 25 minutes, followed by a 5 minute break. This keeps your brain fresh, and you will get through tasks much more efficiently. There’s an app for that. Set specific times to check and respond to email. Turn off notifications and only look at email as often as needed for your particular organization (some companies expect constant vigilance, while others barely use email). Set expectations with your colleagues and friends if necessary. Focus on what you can actually finish (and set a parameter for “done”). There are some things that lack a clear finishing point, but it’s important to be able to say “I’m done with this” and move on. This allows you to let go of that task completely and focus on the next thing. MYTH 4: Creative work is not productive (unless you can sell it). Creativity is a vital part of any kind of work, and part of what makes us human. Do you like to draw, write, perform, design games, redecorate, etc? That work is important to your overall productivity and it should be treated with as much respect as all the should do’s. Continued creative practice will improve your problem-solving abilities and keep your thinking adaptable to shifting circumstances. If you have lost touch with your creativity, you might try one of these. Morning Pages were introduced by Julia Cameron in ‘The Artist’s Way,’ and thousands of people swear by their life-changing qualities. The basic idea is that you write long-hand stream of consciousness for three pages shortly after you wake, to clear the cobwebs and get the gears turning. If you prefer typing, give 750 Words a try. What did you love to do as a kid? Revisit your early passion for creative play by investing in some crayons or a Spin Art machine. Be creative on the internet. Post photos, essays, or just clever tweets to sustain your creativity. If you’re a parent, take on creative projects with your kids. Build a fort or redecorate their room together. Get a coloring book for adults. There’s little as soothing as spending an hour trying to stay inside the lines… or thinking of creative ways to cross the lines. Make a thing. Paint a picture. Craft a handbag from recycled materials. Build a time machine! MYTH 5: There is one productivity tool to rule them all. Many swear by one particular piece of software, app, or productivity system, but the truth is there are different kinds of tools needed for different kinds of activity. Some people are perfectly happy with paper and pen solutions, but I like technology. Here are some of the tools I use or have used, and what I like about them. For project planning and task tracking, I like Wunderlist and Asana. Wunderlist has a simple task list UI and syncs to multiple devices and the cloud. Asana is designed for collaboration and negates the need for project-related email. For keeping track of everything else, I have used Evernote for years. And I mean everything else. I have over 30 Evernote notebooks, and over a thousand individual notes. This also syncs to all of my devices and the cloud, and it is very searchable. It also has great collaboration features I have never used. I prefer Google docs for document collaboration. In my current job we rely on Microsoft Office products and the collaboration experience is still not there. Plus Gdocs has a simpler UI, autosaves continuously, and outputs easily to Office formats. But then Google has all your docs, of course. Developing daily habits (the dishes!) is the foundation work for productivity. And it’s very, very hard to do. It’s best to focus on one habit at a time and start with the smallest possible step. Tiny Habits and Zen Habits have good tips for this, and Habit List and Coach.me are excellent tracking tools (the latter with social and coaching features). Quality is as important as quantity, and Balanced is an app that will help you keep track of the areas of your life that are important to you, so you are not putting too much of your productive energy into one life area. It is similar to the “life wheel” concept. Kan Ban kan. Kan Ban is a technique much touted by Agile PMs. This method is great for task tracking, less good for longer term project planning. The gist is to divide current tasks into: In Progress, Next, and Backlog. Choose only 3-4 in progress tasks and focus on them exclusively (purists only do ONE, but sometimes there are work pauses when you need to change focus). 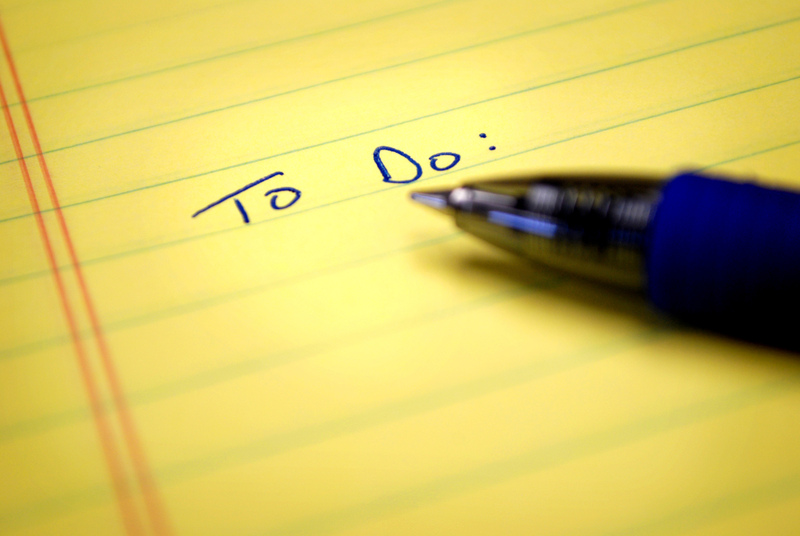 Move over a new task from Next whenever one is complete. I like Kanban Kit for its simplicity, but Trello is a great cloud based solution for small teams or individuals. MYTH 6: Productivity happens in a vacuum. It seems to be a given that low productivity is a personal problem. And if you get your act together and set up the right system you can do ALL THE THINGS and be a happy, relaxed, successful person! You can’t. You can’t do all the things and you can’t do them alone. In any organization, you need organizational and structural support to do the work you want to do efficiently. Employers often unwittingly keep people from improving processes or trying different/ better ways of doing things. In all areas of life, you need others in some form or fashion in order to succeed. Is there a better way to do things? Propose it, and find people who will advocate for change to support you. Do you need help or advice? Seek it out. Someone out there has probably faced the same roadblock, so ask a friend or colleague or Quora. Overwhelmed? Ask for help. We’ve all been there. Sometimes all you need is a little assistance to get out of the quagmire. Depressed? Acknowledge it. Depression is a productivity vampire and when you are dealing with it, you will struggle. See #3. Don’t have the skills? Somebody does. Hire them or learn from them. MYTH 7: Downtime is unproductive. Downtime is probably the most productive way to spend a few hours every day (not counting sleep, which is also productive). When learning something new, your brain actually does most of the learning when you are not actually doing the thing. Same goes for writing and other activities requiring a lot of mental focus. Pomodoro technique builds in short breaks, but be sure to give yourself a few longer breaks throughout the day. Embrace doing nothing. Whenever possible, put aside the screens and sit somewhere quiet and beautiful to just… sit. If you like doing it, go ahead (within reason). Love bad TV? Want to play a computer game for nine hours? Need a martini? You have my permission. This is all helping you to prepare for your next bout of productivity. Just be careful not to get stuck or addicted. It’s a break, not the norm. Social time is important to mood, which is important to productivity. Make time for friends and family who give you energy. A final thought: After writing all of this I realize that I have some internalized assumptions about what productivity means to people. All of this comes from a privileged perspective where these concepts and tools are relevant to my daily life. This is not the case for most people. I hope you find some of this useful, but I understand that much of it will be irrelevant or even inaccessible to many people. The “cult of productivity” has developed as a primarily white male tech subculture, but I think some of the core concepts here can be valuable for anyone.